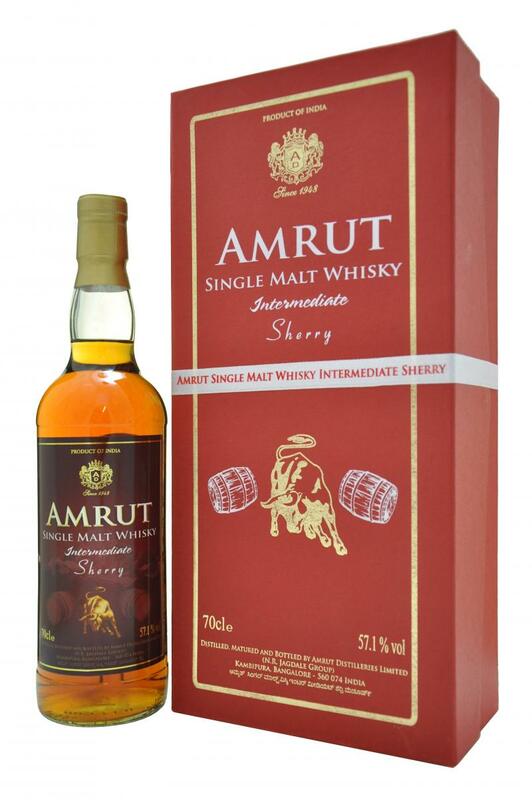 I usually enjoy Amrut. A lot. For me, Kadhambam is just a great whisky, definitely on my top-twenty list of personal favourites; Fusion is a good one; and I really enjoyed naarangi; some of their single casks are really nice, too. I have an affinity with their style, it seems. But what happens when I try an Amrut and I don’t even know that that is what I’m drinking? The tasting notes below were written for an online blind tasting. They are coloured by me trying to guess what whisky I was drinking; I could edit those parts out, but then again, I think that would be less fun for you to read. And hey, at least I got the distillery right, at the very end! Amrut Intermediate sherry: a huge box for a big whisky. On the palate: as expected, this is not cask strength, and not complex enough for a (slightly older, say 12 YO) Hazelburn. A nice sherried dram with a certain peppery quality to it, lots of banana, while coffee and cocoa are also at the forefront. It’s a screamer of a whisky! With water: more peppery, more herbal, and almost… prickly, if that is the right English word for when the alcohol kind of attacks your mouth a little. The fruits from the nose don’t really follow, again implying a slighly younger dram. Finish: oh, but where did you go, my friend? It just vanishes! After a brief while though, lots of things happen. There’s that slightly astringent bitterness which many have a hard time with in whiskies which have been matured or finished in port casks, but which I enjoy so much. Also, lots of fruit, both citrus fruits and something drawing towards the direction of apricots, and even mangoes. Some burnt oak. A slight touch of ashes. With water: again pricklier, more herbal; if there have been bourbon casks involved, they really reveal themselves here. The nose really improved with water, but on the palate and in the finish, less so. Or perhaps I failed to succeed in how much or little I watered it? However, there is a nice connection between the mineral tones on the nose and the same mineral tones returning here at the very end of the finish. Comments: I believe this whisky is fairly young, definitely younger than 12 years; I usually enjoy my peated whiskies at a young age, while when it comes to sherried drams, I prefer them slightly older. I would like for this one to age a little more, but it shows great potential. A good dram, definitely, but not an amazing one. My guess is that this whisky is at 43 rather than 46% [again, how wrong I was!! ], and my bet is still on Hazelburn. Let’s say Hazelburn Octarine, their 8 YO. But wait, no – I’m more and more beginning to lean towards the Amrut Portonova as my main guess. And these two are very different whiskies, too! No, I’ll change my guess and say that this is Amrut Portonova. Here, my blind tasting notes for that evening a while back end. As you already know from the heading of this blog post, the answer to the riddle was Amrut intermediate sherry. It is called intermediate since it has been matured in three steps: first in bourbon cask, then sherry casks, and then back to bourbon casks. (The cask policies of Amrut, with creative exploration and innovation at the very heart of their business, is something I admire deeply. Whenever they release a new whisky, it seems like they have invented something new, every time.) This link to whiskybase is for the first batch, released back in 2008; the one I tried was from batch 15, bottled in August of 2014. Normally, the easiest part of any blind tasting is guessing the alcohol level. In this blind tasting, carried out together with some really experienced whisky drinkers, most thought the whisky was at 46%. It is, in fact, bottled at a staggering 57,1%. That you can drink it neat and think it’s 46 and even, as I thought, at 43, is as good a tribute as any to this powerful and well-made whisky. I like the fact that you DO write in English. Swedish or English, it’s always an interesting read. A lot of whiskies tend to have notes of christmas cake and I can tell you it’s something I eat every christmis, it’s a fantastic dense cake full of raisins, cherries, currants, sultanas, almonds, cinnamon and whiskey( i use the Irish stuff). They are the base ingredients and there are many different variations of the cake, some use brown sugar, other a fine castar suger (finkornig strösocker) . I’d be happy to arrange for a slice or two of the cake to come your way this year, so you can break down the flavours in it and see if you can find the similarites that come in those special whiskies with notes of christmas cake.